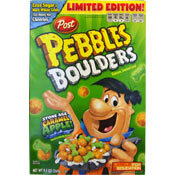 The complete name of this cereal is Stone Age Caramel Apple Pebbles Boulders. It's comprised of tan boulder (round) pieces and green dinosaur bone pieces made primarily from corn and oats. The apple flavor is most prevalent. Caramel is barely noticeable. The only time you really taste caramel is in the milk left over in the bowl. A word of warning: don't smell this cereal in the box. Frankly, it smells sour. Fortunately, that sour apple sensation translates to a simple, sweet tartness in flavor and that tartness mellows with each passing spoonful, leaving just a unique sweet apple flavor. Tart apple isn't a popular cereal flavor. It sounds like it might be weird. It is... at first. This is one of those cereals (which usually get discontinued quickly) that you have to get used to. Give this one at least 3 spoonfuls before you cast your final judgement. 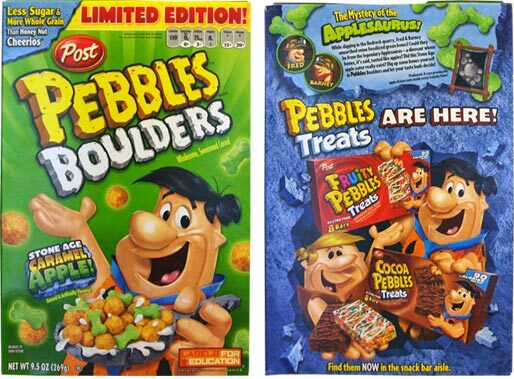 If you're a big fan of apple flavor... or if you're like me and always looking for new flavors in your breakfast cereal... give Pebbles Boulders a try. 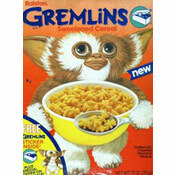 It's a "limited edition" cereal, so it won't be around long. For everyone else... if it smells funny and takes three spoonfuls before it tastes good, I can't really recommend it. But props to Post for trying something new. Nutritional Considerations: Each 3/4 cup serving has 110 calories, 1.5 grams of total fat (0 saturated and 0 trans), 0mg cholesterol, 75 mg sodium, 22 grams total carbs, 2 grams dietary fiber, 8 grams sugar and 2 grams protein. What do you think of Pebbles Boulders? Love most Pebbles cereals, but not this one. My whole family tried it and even the little ones didn't eat it. Gross. This cereal is back with chocolate & peanut butter, but it kinda tastes like an Reese's peanut butter cup. Go on www.pebblesplay.com to see the updated Boulder Coaster game & the commercial. This cereal smells awful... right when I opened it I almost vomited. My own 4 year old daughter who normally eats anything wouldn't eat this due to the smell as well. Threw this one in the trash can. Very bad. Worst smell ever! This cereal stinks and taste GROSS!! !